Officials from the National Park Service and the Florida Fish and Wildlife Conservation Commission returned a rehabilitated Florida Panther to the wild yesterday. The release took place in a remote area of Big Cypress National Preserve late Wednesday afternoon. The panther, a three year-old female known as #120, was injured after being struck by a vehicle on U. S. Highway 41 in July of last year. Panther #120 suffered a compound fracture of her rear left leg, severe blood loss, abrasions and damage to her teeth after being struck by a motorist during the evening hours on July 11, 2004. FWC officers had increased patrols near Ochopee, slowing traffic through a “panther slow speed zone”, due to reports from NPS biologists of panther movements in the area. Unfortunately, panther #120 was still struck. The officers had just warned the driver of a vehicle to slow to 45 mph, prior to the car striking the cat. “The efforts of FWC probably saved the cat’s life,” said NPS Biologist Deborah Jansen, “If they had not slowed the car, the results could have been fatal. The installation of proper wildlife underpasses and fencing throughout critical panther habitat would help avoid these incidents altogether"
Biologists found the cat early the following morning. The animal was transported to the University of Florida Veterinary School in Gainesville for evaluation and surgery. After recuperating from the injuries, panther #120 was transported to the White Oak Conservation Center in northeast Florida, where she made a full recovery. Dr. Mark Cunningham, FWC veterinarian, has been overseeing her care and brought her home to Big Cypress on Wednesday, May 4, 2005. Biologists know that at the time of being struck, panther #120 was rearing two kittens. After the accident agency personnel searched unsuccessfully for the five-month-old cats. The likelihood was that they would not survive without the mother. Three weeks later the male kitten was struck by a car and killed on U. S. 41, near the site its mother was injured. The female kitten was never found and most likely has perished. 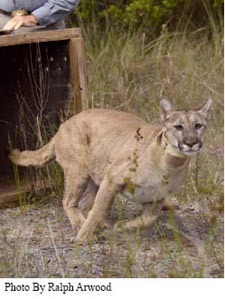 Recently southwest Florida has seen a high number of panther fatalities due to being struck by cars. Since January 2005, 3 panthers have been killed in cat/car accidents. In the past 10 years, agency officials have documented 55 panther deaths due to car accidents. The recent accident with panther #120 is the only one of the 55 in which the panther survived. Just three days after being released, the Florida panther known as FP #120 was killed by a car. The cat was struck and killed on May 7 around 6:00 in the evening. FP #120 was returned to the wild on Wednesday May 4 after recuperating from injuries caused by a car accident in July of last year. The cat quickly returned to its old territory, where again it crossed busy US Highway 41. The cat was struck and killed near the same area it was injured 10 months earlier.